The LONGBOW emergency operations pack has achieved legendary status in Conterra's fabulous line of EMS and rescue products. It was originally designed for the U.S. Air Forces Para Rescue Technicians. The Longbow is ergonomically designed with a vacuformed Kydex frame to ride like it's part of you, whether you are rappelling, skiing or crawling. It has a large zippered medical supplies compartment which is separate from the main pocket. The Longbow is hydration-compatible and has numerous outside attachment points and ski carriers. 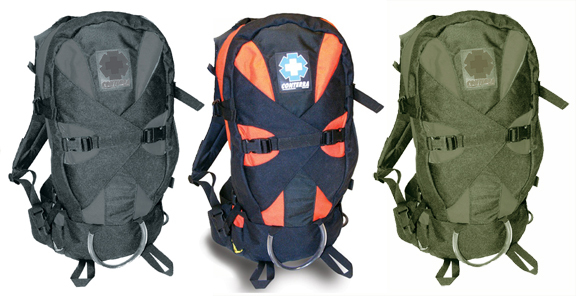 Combine the LongBow with Conterra's Modular Organizers for further customization of your medical and SAR supplies. This is the perfect pack for search and rescue, ski patrol, or tactical operations where going "light and lean" is essential. Carries skis or snowboards better than any other pack we've seen. Medical supplies not included. The Longbow IDM Pockets are the perfect organizational add-on for the Conterra Longbow. This has quickly become my favorite "go" pack for SAR missions. I have taken it on 3 missions so far and have been pleased with its compartmentalization features and versatility. I purchased this pack recently to use it as my SAR hasty pack. I really like the ample room for personal gear and, as my co-SAR member said my "mobile OR." I really appreciate the design features and the flexibility in design and use of this pack. I will just have to test it more closely in the field for more specifics.